Tariffs and Trade Wars: Part I — MacKay & Company, Inc.
Now, let’s take a look behind the headlines. International trade is a complicated topic with its own field of study within economics and law. Part of the complexity of this topic resides in the fact that it has its own language, so we need to define a few terms to explain what that headline of “countervailing duties” actually means. The principal means of collecting the tariff are customs duties. A countervailing duty is an action taken in response to the imposition of tariff by a trading partner. You tax our soybeans, we will tax your washing machines. The three key words in that definition are: protection, balance-of-payments, and revenue. The government is interested in the revenue and the importers and exporters are interested in the protection. All parties have some interest in the balance-of-payments, but are perfectly willing to overlook that if it suits their immediate interest. In the United States, the theory and practice of international trade dates back to Alexander Hamilton at the founding of the republic. His plan for the financial and economic development of the United States was based on the concept of a system of tariffs that would protect our “infant industries.” By putting a tariff, or a tax, on goods imported from the rest of the world, we would give our domestic producers the chance to develop the productive capacity to serve the domestic market first, and later to export to the rest of the world. This theory of international trade is known as Mercantilism. Those of you who took the course in international trade, might recall that several economists, the most famous being Adam Smith and David Ricardo, knocked down this idea as being inefficient and counterproductive. Their view was that international trade, based on the comparative advantages of each country, would lead to a higher level of output and employment in all countries. Smith and Ricardo’s example was of two countries both of which produce shoes and wine. Country A makes very good shoes and very bad wine. Country B makes very good wine and very bad shoes. The theory says that both will be better off by maximizing the output of what they do best, sell that, and then trade for the rest. In the end, according to Smith and Ricardo, everyone in both countries would have both good shoes and good wine, at the best price. That’s the theory. The practice is the system of tariffs that Hamilton advocated here and his counterparts elsewhere followed until very recently. After World War II, global attitudes about trade began to change. The Bretton Woods agreement established rules for currency exchange rates and flows of finance capital. Europe moved towards a common market. The United States took the lead in developing multilateral trade agreements that involved just about every part of the world. And, until very recently, all parties in all parts of the world were looking to find more ways to expand trade. The rise of the multinational corporation further blurred geographical boundaries. Free trade became a major tenet of both political parties in the United States. What changed? The political landscape, both here and abroad. Starting with Brexit and continuing through our presidential election and elections in several other countries, the factions who feel that free trade should be replaced with fair trade –however defined – have taken over the levers of power. Tariffs are not “one size fits all”; they are “tailored”. Our tariffs on aluminum and steel from China resulted in Chinese tariffs on our soybeans. If you don’t see the economic connection between those two events, it’s because there isn’t one. These are political actions taken for political reasons. And that’s why we repeat, in a slightly, different form, the advice we gave you earlier: tariffs will hit individual companies differently. You will need professional counsel, not that of an economist or, much less, that of a politician, but from an attorney and the Customs Service. Because a tariff is a tax, you can look into ways to avoid a tariff the same way as you look into ways to avoid a tax. If the government has decided to put a tariff on Chinese steel but not on Mexican steel, can Chinese steel be replaced with Mexican steel to avoid the tariff? Is there a domestic producer that could become the source of supply? Our government would certainly like that to be the outcome. How much will it cost to refashion the supply chain to avoid the tariff on Chinese steel? Additionally, tariffs, like taxes, add to the cost of doing business. The question then becomes who absorbs the higher costs. For some firms, it might be possible to pass along the higher cost through a higher price. We recently saw that a producer of paper goods is planning to raise its prices because of the higher cost of inputs purchased abroad. But charging higher prices is not always an option, so producers may have to take other steps to protect their profit margins. All of which is to remind you that changes in tariffs can have effects that go well beyond the particular item in question. By putting a tariff on steel, we affect the way steel is sourced and is used. We also affect the supply chain and the production and employment process. In short, we introduce additional sources of uncertainty and instability on top of those those associated with the normal course of operations over the life of the business cycle. And, because of the political nature of these events, we also introduce elements that can undermine business confidence both here and abroad. 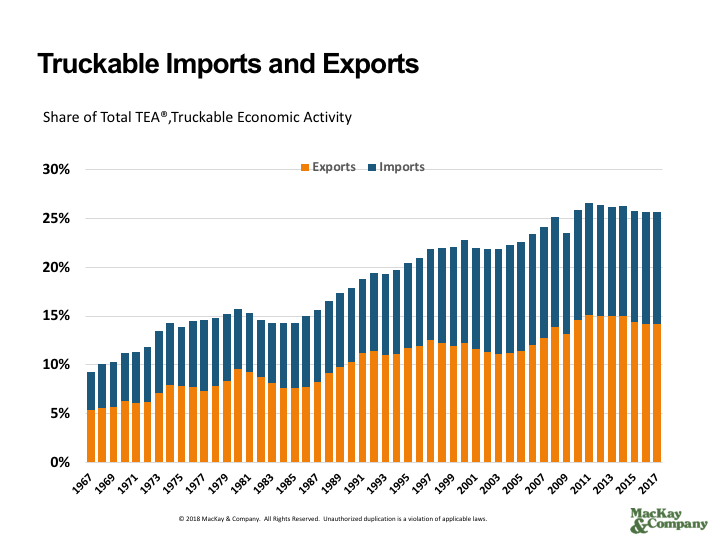 Imports and exports now make up 25% of total Truckable Economic Activity. We will report the quantitative effects of the tariff dust up through those statistics in the next edition of TEA®, which we plan to publish in early September. We will keep you apprised of political and industry news through future bulletins such as this one. Have thoughts on the new wave of tariffs? Let Bob know your thoughts.